In England for the first time in years, we got proper snow! This meant everything and everyone went into meltdown and school was shut for 3 days! Along with all the fun I had, it gave me chance to change up my makeup. When I’m at school I don’t wear makeup so I only end up wearing makeup on Saturdays so I don’t try much new but having the 3 days off I tried some new / old products and discovered some favourites! in order of applying to the face with a foundation. My auntie brought me this as it didn’t suit her and I’ve fallen in love with it! The clarins everlasting foundation has such lovely coverage, really doesn’t cake & just looks flawless on my skin. I’ve really taken a like to it as it’s a really natural dewy look that looks so nice on my skin I think it’ll be a perfect summer foundation and it has SPF 15 in it too. Next is something that’s definitely no stranger to the internet recently, the makeup revolution conceal and define concealer. 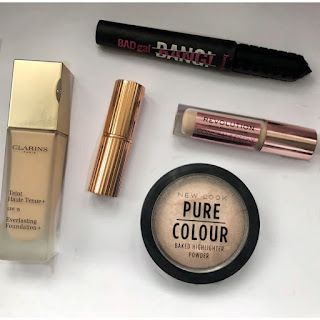 I reviewed this and I stick to everything I said - it’s full coverage and long lasting pretty much everything everyone wants in a concealer at the drugstore price of £4, you really can’t go wrong with it. This highlighter is one of my favourites and was recommended from a YouTube video but I don’t remember which, but now you can’t get it as they changed the formula and packaging. I’m not sure if the current one is like this, but this is a blinding light pink highlighter that literally makes you glow to the gods. It’s perfect for winter as it looks icy white on the face and I love it & wish I reached for it more but gold highlighters are my favourite. I don’t think anyone will be surprised to hear me talking about this mascara, it’s pretty much the rave at the minute. The benefit badgal bang mascara is everything and more I’d want in a mascara. I’ve done a review of this and from then I was in love with it from age I first tried it, It gives the same look as my lashes with 5 different mascaras on. I think now it’s my holy grail. Trying makeup that’s been just stored and you haven’t used in ages is always good - especially when you discover gems you either just stopped using or forgot out! I do really stick with my favourite products so it’s nice finding new products I already have to try! Charlotte Tilbury makes some amazing lipsticks doesn't she?! I own Bond Girl and it is my go-to lipstick. It is such an opaque color and it doesn't wear off in a weird, patchy way. I haven’t heard of this mascara but i’m sure it’s good. I love your recommendation to go back and look through your makeup for things you may not have used for a while. Good post! And I love highlighters too!